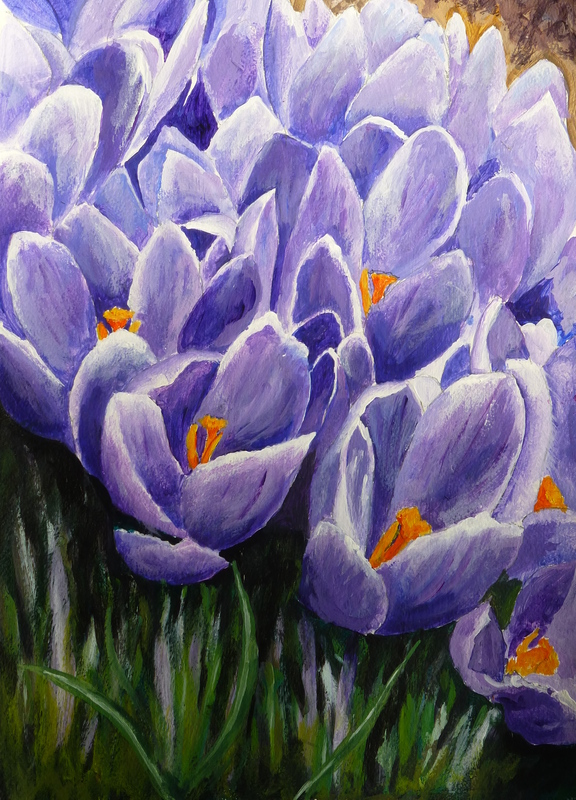 This entry was posted in acrylic, crocuses, floral and tagged acrylic, acrylic painting, acrylics, crocus, crocuses, floral. Bookmark the permalink. Gosh, I thought this was a photograph. Beautifully done! Congratulations on your sale and good luck at the exhibition. I agree, it’s far to good to be a photo. Yup, looking on a phone, from bed, first thing in the AM, yeah! I follow lots of photographers. And I have crocuses just like this. I thought it was a photograph, at first. It’s really well done, I think. Sometimes painters treat, it looks like a photo as an insult. And sometimes it is meant as an insult, though I know nothing was further from your mind. I don’t mind criticism, it is very hard to get and you can always reject it, but it is worth having, nonetheless. Oh, I’m so glad you told me that, because I had no idea. I did mean it as a sincere compliment. I appreciate constructive criticism, as well. I don’t feel comfortable handing it out, though, especially at my skill level. I’m glad you weren’t offended by my comment, because I do so admire your work. Yeah, macca does do his best for a newbie. Congrats on the sale and the exhibition! Isn’t it amazing how these crocus inspire? Implied, tell me if I am wrong, implied in the painting is the detailed observation of the crocus by the painter…the painter’s obsession with the color, the form, the very essence, the energetic presence of the crocus…am I wrong? Thoroughly enjoyed your crocus painting! Thanks, the hues and tones of the purples and blues gave a busy mass that seemed to express the exuberance of spring and the complementary yellows and oranges of the stamens gave it further energy.